Hewlett-Packard has given a glimpse of what the company's separation looks like from an internal IT perspective, and not surprisingly, there are some big numbers involved. The ongoing task involves dividing up or retooling 2800 applications and 75,000 APIs (application programming interfaces) before the company becomes Hewlett-Packard Enterprise and HP Inc. on November 1. Before the transformation began, HP had 50,000 servers in six datacentres. Five thousand IT staff are working on the transition at any given time, said John Hinshaw, head of HP technology and operations, at the HP Discover conference. HP has been preparing for the split since it was announced last October. The work is 80 per cent complete, according to Hinshaw, and HP will actually start to operate as two companies on August 1, he said. That will give each company three months to iron out any problems and make sure things are running smoothly before the legal separation in November. HP Enterprise will be home to the company's data center products, including servers, storage, network gear and software, as well as its enterprises services division. HP Inc. will sell its PCs and printers. As reported, Meg Whitman will be president and CEO of HP Enterprise, and Dion Weisler, who currently runs the PC and printer businesses, will lead HP Inc.
One big number Hinshaw didn't mention is that HP has laid off some 50,000 workers over the last two years to improve its profitability, a restructuring that was still under way when the company announced its plan to separate. The company has almost 300,000 employees altogether. "We believe this is the biggest split of its kind," Hinshaw said, and HP is documenting it all so it can share what it learns with any large companies that have togo through the same thing, presumably as part of HP services engagements. The split probably would have been more complex if it weren't for HP's former CIO Randy Mott, noted IDC analyst Matt Eastwood. 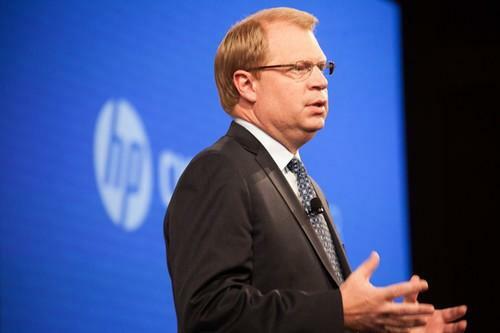 Several years ago he consolidated HP's infrastructure from 85 datacentres to six, making Hinshaw's job an easier one.